Over several years Kamal Swamy has been quietly banking his coaching experience. He’s been an assistant coach for several Fiji teams including the U-23 and senior sides and took the main job for the Fiji U-17 squads in 2015 and 2013. Although he is probably better known for his domestic feats where he led Nadi to their OFC Champions League return in 2014 after a 15 year absence, and has done the same things with Lautoka who he lifted back to the regional stage this year for the first time since 2009. Right now Swamy is on track to achieve the highest level coaching accreditation available in Oceania – the OFC A Licence – and believes his experiences with the Nadi and Lautoka have been instrumental in his getting this far. “I think the OFC Coaching Pathway has helped me a lot,” he states. “I think when I did the B Licence it was in the moment, concentrating on one thing at a time. “Now with the A Licence it talks about philosophy and the way you want to play, the kinds of players you want to have. You’re always looking at what happens next – what happens when you win the ball, the transition. What has been clear to Swamy for his 2018 regional campaign, compared with those in 2014 and 2015, is what he has been able to contribute from a coaching perspective. “I’ve had ideas about what I’ve wanted to do in the past with other teams and I think coming through the A Licence with the aspects of philosophy that are incorporated in the sessions, I made up my mind ‘yes, this is what I am going to do’. Swamy has been with Lautoka for two years now and said he is proud of what the club has built over that time. “In two years we have followed the philosophy and we have done wonders in the local competitions. I think that’s what the club was missing before, they had great players but never really has a philosophy or defined system of play. “I think the team enjoys having this structure now, it’s brought a lot of success to the club,” he said. Although he sounds confident in his approach to coaching, Swamy said it wasn’t always the case. “When I brought Nadi to the OFC Champions League it was very bad for two occasions and I personally felt like there was something wrong with my coaching,” he said. “But when I came here to Lautoka the club administrators showed they have confidence in me, they’ve given me all the requirements I need to have success and I think this is why we are now in the quarter finals of the champions league. OFC Head of Education Giovani Fernandes said it is always pleasing to see a coach coming through the pathway, applying their learnings in the regional environment. He said with Swamy, he can see the principles of the OFC B Licence and A Licence being applied. “I think what is interesting is that Kamal, along with some other coaches from Fiji Football Association, have gone through the process and have actually created a team model for Lautoka,” he explained. “They implemented the team model across the planning and preparation, not only for the national league but also for the champions league. In addition to the introduction of a playing model, the application of Swamy’s learning can be witnessed in his recruitment of players. 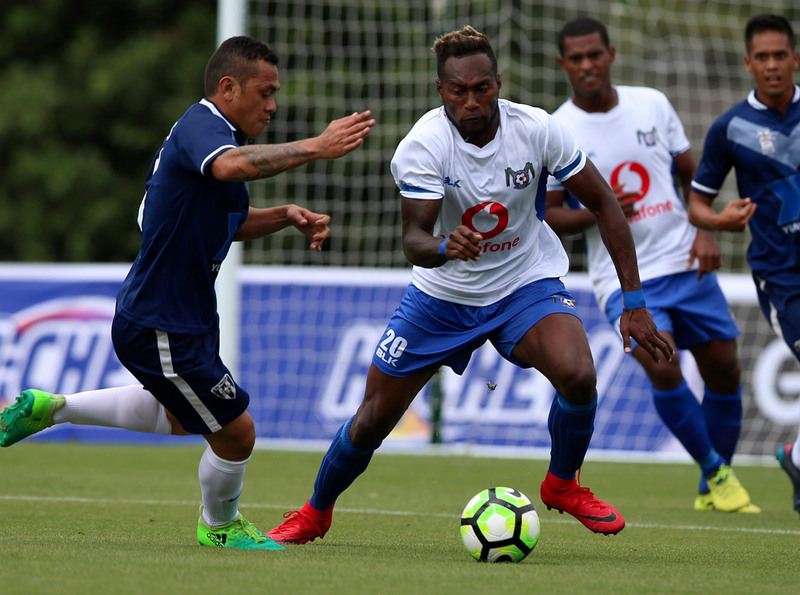 A change to the OFC Champions League regulations has restricted foreign players to just three, plus one from the Oceania region. Lautoka has brought in Vanuatu’s Brian Kaltack in defence, Cory Chettleburgh from New Zealand in the midfield and Solomon Islands striker Benji Totori is leading the attack. “They’ve brought a lot of experience in our team in positions where we were lacking a little bit,” Swamy explained. “They’ve gelled well with our players and what we have found is the football is basically the same, but they have more technical styles of playing. “Cory has brought a lot of experience to the midfield. I think he’s oneof the great players in New Zealand and his expertise has helped us a lot as he has also been explaining things to the players. Fernandes agreed that the choices Swamy made in terms of who to bring in to complement the team has been successful. “What we can see is a structure in Lautoka associated with the way they would like to play in the future. For the first time you see players like Brian – those are the players who directly complement what they are trying to do,” he said. “In the past we would associated Fijian teams with a more direct style of play and with Brian complementing the team you see Lautoka trying to build up in the different zones. “With Totori you’ll see a bit more combination play and the ability to explore one-on-ones in the final third, which again is related to the way they want to play.